Let’s Get Our Feet (or Hair) Wet! This clinic is designed for new paddlers or those who have been in hibernation for a while. This is your opportunity to learn (or brush up on) paddle strokes, catching eddies and ferrying with plenty of supervision and assistance (should it be needed). 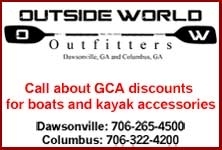 This clinic is for kayakers and canoeists! We are joining forces to make sure we get all paddlers safely out on the water this spring. This is a two day clinic and will be on local rivers. On day one, Saturday, we will start with a lake session and then paddle a short, easy section of river (hopefully the Metro Hooch). On day two, Sunday, we will paddle a slightly more challenging river (along the lines of the Upper Hooch or Cartecay). This class is designed for people who have their own boat and gear but if you would like to take the clinic and do not have all of your gear let us know – we might be able to help you out.